So, above are the 2 rascals that started it all (meaning my obsession with animal welfare and determination to find out more about the after-life). This photo is one of my favorites because since they have both passed on, it makes me think of 2 happy aliens about to board the Mother Ship to Heaven. Where I believe we will meet again. The Pit Bull came first. He was a genuine ambassador for the breed. He loved children and he loved other dogs. He was a clown, an athlete, a compassionate buddy, a model citizen and all-around adorable fellow. He was my heart, my boy. The Jindo arrived a year and a half later. She was noble, elegant, snotty, loyal, unintentionally funny and beautiful. She completed our perfect gang of 3. At the age of six, my pit bull began to suffer from strange sores on his legs. Over the course of 2 years he suffered as we went from vet to vet, desperately seeking a diagnosis and cure. We were prescribed steroid after steroid. We even drove 200 miles to try an ion treatment from a holistic vet. The final blow came when a vet literally punctured his spleen while attempting to draw fluid. As a result we ended up in surgery at what was supposedly one of the best specialists in the state. The surgery went as well as it could have and they removed his spleen. I was allowed to visit that night. He was frowning and his breathing was labored. I asked a nurse on duty to have a vet look at him but I was told quite curtly to go home and let the professionals do their jobs. The next day, I received a personal call from the head of the hospital because my dog had "crashed." They had fed my dog, in his weak condition, solid food the morning after taking out his spleen. He ate hungrily and vomited, then collapsed. I cannot describe the agony of the 2 hours I spent as every possible attempt was made to revive him. Eventually I had to admit that he was gone. I knew I should have pursued malpractice litigation against the vet that punctured his spleen and the specialists for feeding him solid food after a major surgery but I could not go in that direction without a murderous rage overwhelming all my capacity for rational thought. I had to walk away from that abyss. My Jindo carried me through the worst days; because of her, I kept on going. We shared our pain, and that made it bearable. 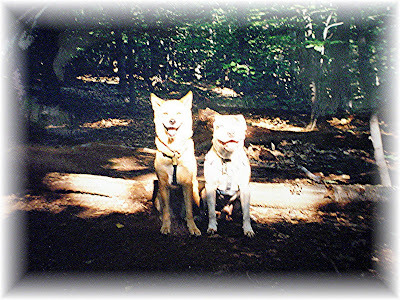 I had never seen a dog grieve and would not have believed that they weep, if I had not seen my Jindo do this. For the first few weeks her eyes sunk inward, and they were often moist with tears. She and I had certain habits that included the pit bull and we would automatically take certain actions, then stop short. For months, she searched frantically for him whenever we went out. Eventually we found our soft joys in the midst of our sorrow. There were many golden moments she and I shared quietly. But I guess her grief was too great. 2 years later, I found myself at the other state specialist, for exploratory surgery on her strangely swollen belly. The surgeon closed her up and told me that cancer had riddled my Jindo's internal organs and she was "bleeding out." When she came out of the anaesthesia she began to cry incessantly. I had never heard this proud dog cry like that, in all the years I had known her. It tore my heart to shreds. I called my friend, one of my dog's favorite people, and it was only when my friend sat on the floor, with my dog's head in her lap, that my Jindo finally gave a great sigh and stopped crying. My family came later that evening. We watched as my Jindo was brought into a private room. Her balletic grace was completely gone as she staggered blindly into the room, delirious with pain. I lay my cheek on her side and my brother held her front paw as the needle entered her vein. I was blessed to have each of them in my life for just short of 8 years. 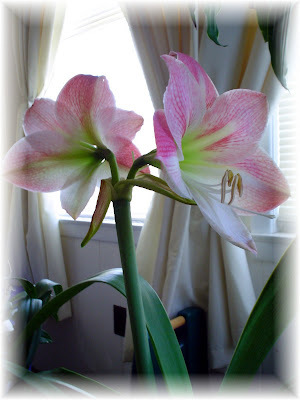 The morning after my Jindo died, I went into our sun room and saw that a huge, pink two-headed lily had gone into full bloom overnight. I could almost feel the peace radiating from their souls, telling me they were okay and free. After all the suffering, they were finally home.